The final digital humanities project that I plan to produce for HST 812 will actually act as a pilot project for something that I hope to earn a Cultural Heritage Informatics Graduate Fellowship to develop further in the near future. As I have discussed in multiple blog posts throughout the semester, my objective is to design an interactive web map that will dynamically illustrate Native American movement across the Great Lakes region as the United States government seized more and more land through treaties over the course of the nineteenth century. To accomplish this task, I first compiled a corpus of 25 treaties signed between 1795 and 1855. I selected the treaties for my corpus based on their prominence in secondary sources beginning with the Treaty of Greenville – the first major treaty with Native Americans after the American Revolution – and ending with a trio of treaties with both Odawa and Ojibwe bands in what is now Michigan . Considering the limited amount of time left in this course, it would be infeasible to incorporate every single aboriginal group who participated in my selected treaties’ negotiations and signings into a single map. Therefore, I plan to plot out the more manageable mobile histories of five bands, laying the groundwork for an even more advanced future project. In her monograph Indian Women and French Men, historian Susan Sleeper-Smith argues that “Indians have existed as viable, distinct people from the earliest times to the present and…while encounter changed indigenous communities, it also encouraged the evolution of strategic behaviors that ensured cultural continuity” . Historian Michael A. McDonnell concurs with this assertion, but adds that agreeing to treaty negotiations could actually be interpreted as one of these strategic behaviors . Undeniably, many Americans did not respect or comply with treaties that the United States government reached with the Anishinaabeg of the Great Lakes region or other aboriginal groups, but for some bands treaties offered a powerful opportunity to resist violent removal. Visualizing treaty data offers one compelling avenue to demonstrate this. I have decided on the technologies that I will deploy for my final digital humanities project after consulting with Ethan Watrall. He recommends first constructing a website from the ground up using Bootstrap. Not only will this act as the hub for my web map, but it will also provide me with some space for an interpretive essay once my map is complete as well as a bibliography or section for recommended readings. When I have my website fully formed, Leaflet will provide me with the tools necessary to build my map, including a time slider accessible through GitHub that will help my map more effectively convey change over time. While these methods will undoubtedly be more complicated than simpler software as a service, I suspect that they will also be more sustainable, and continue to be accessible to me when I revisit this work. Helen Hornbeck Tanner, Atlas of Great Lakes Indian History (Norman: University of Oklahoma Press, 1987), 69. Susan Sleeper-Smith, Indian Women and French Men: Rethinking Cultural Encounter in the Western Great Lakes (Amherst: University of Massachusetts Press, 2001), 2. Michael A. McDonnell, Masters of Empire: Great Lakes Indians and the Making of America (New York: Hill and Wang, 2015), 326-27. Phil Bellfy, “Cross-Border Treaty-Signers: The Anishnaabeg of the Lake Huron Borderlands,” in Lines Drawn upon the Water: First Nations and the Great Lakes Borders and Borderlands, ed. Karl S. Hele (Waterloo, Ontario: Wilfrid Laurier University Press, 2008), 33-34. Cary Miller, Ogimaag: Anishinaabeg Leadership, 1760-1845 (Lincoln and London: University of Nebraska Press, 2010), 77; “Treaty with the Chippewa, 1826,” in Indian Affairs: Laws and Treaties, 2, ed. Charles J. Kappler (Washington, D.C.: Government Printing Office. 1904), 271-72. Bellfy, Phil. 2008. “Cross-Border Treaty-Signers: The Anishnaabeg of the Lake Huron Borderlands.” In Lines Drawn upon the Water: First Nations and the Great Lakes Borders and Borderlands, edited by Karl S. Hele. Waterloo, Ontario: Wilfrid Laurier University Press. Bohaker, Heidi. 2006. “‘Nindoodemag’: The Significance of Algonquian Kinship Networks in the Eastern Great Lakes Region, 1600-1701.” William and Mary Quarterly 63 (1): 23–52. ———. 2010. 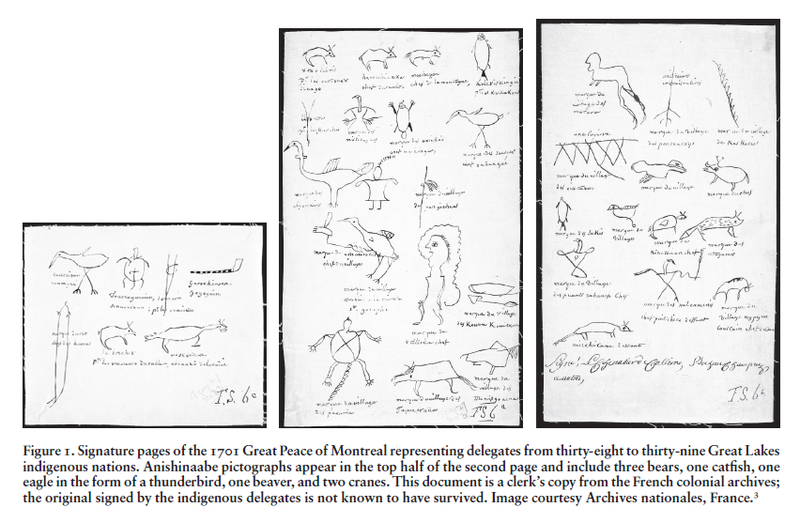 “Reading Anishinaabe Identities: Meaning and Metaphor in Nindoodem Pictographs.” Ethnohistory 57 (1): 11–33. Brazer, Marjorie Cahn. 1993. Harps upon the Willows: The Johnston Family of the Old Northwest. Ann Arbor: Historical Society of Michigan. Chapman, C.H. 1903. “The Historic Johnson Family of the ‘Soo.’” In Michigan Pioneer and Historical Collections, 32:305–53. Lansing: Michigan Pioneer and Historical Society. Cleland, Charles E. 1992. Rites of Conquest: The History and Culture of Michigan’s Native Americans. Ann Arbor: University of Michigan Press. ———. 2011. Faith in Paper: The Ethnohistory and Litigation of Upper Great Lakes Indian Treaties. Ann Arbor: University of Michigan Press. Fletcher, Matthew L.M. 2012. The Eagle Returns: The Legal History of the Grand Traverse Band of Ottawa and Chippewa Indians. East Lansing: Michigan State University Press. Hele, Karl S. 2008. 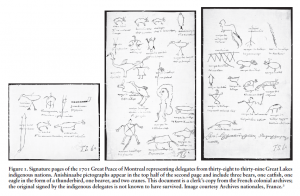 “The Anishinabeg and Métis in the Sault Ste. Marie Borderlands: Confronting a Line Drawn upon the Water.” In Lines Drawn upon the Water: First Nations and the Great Lakes Borders and Borderlands, edited by Karl S. Hele. Waterloo, Ontario: Wilfrid Laurier University Press. Jurss, Jacob. 2017. “Contested Authority: Indigenous Borderlands of the Western Great Lakes.” Ph.D., East Lansing: Michigan State University. Kappler, Charles J., ed. 1904a. “Treaty with the Chippewa, 1819.” In Indian Affairs: Laws and Treaties, 2:185–87. Washington, D.C.: Government Printing Office. http://dc.library.okstate.edu/digital/collection/kapplers/id/26027. ———. , ed. 1904b. “Treaty with the Chippewa, 1820.” In Indian Affairs: Laws and Treaties, 2:187–88. Washington, D.C.: Government Printing Office. http://dc.library.okstate.edu/digital/collection/kapplers/id/26029. ———. , ed. 1904c. “Treaty with the Chippewa, 1826.” In Indian Affairs: Laws and Treaties, 2:268–73. Washington, D.C.: Government Printing Office. http://dc.library.okstate.edu/digital/collection/kapplers/id/26109. ———. , ed. 1904d. “Treaty with the Chippewa, 1837.” In Indian Affairs: Laws and Treaties, 2:482–86. Washington, D.C.: Government Printing Office. http://dc.library.okstate.edu/digital/collection/kapplers/id/26323. ———. , ed. 1904e. “Treaty with the Chippewa, 1842.” In Indian Affairs: Laws and Treaties, 2:542–45. Washington, D.C.: Government Printing Office. http://dc.library.okstate.edu/digital/collection/kapplers/id/26383. ———. , ed. 1904f. “Treaty with the Chippewa, 1854.” In Indian Affairs: Laws and Treaties, 2:648–52. Washington, D.C.: Government Printing Office. http://dc.library.okstate.edu/digital/collection/kapplers/id/26489. ———. , ed. 1904g. “Treaty with the Chippewa, Etc., 1827.” In Indian Affairs: Laws and Treaties, 2:281–83. Washington, D.C.: Government Printing Office. http://dc.library.okstate.edu/digital/collection/kapplers/id/26122. ———. , ed. 1904h. “Treaty with the Chippewa, Etc., 1833.” In Indian Affairs: Laws and Treaties, 2:402–15. Washington, D.C.: Government Printing Office. http://dc.library.okstate.edu/digital/collection/kapplers/id/26243. ———. , ed. 1904i. “Treaty with the Chippewa of Saginaw, Etc., 1855.” In Indian Affairs: Laws and Treaties, 2:733–35. Washington, D.C.: Government Printing Office. ———. , ed. 1904j. “Treaty with the Chippewa of Sault Ste. Marie, 1855.” In Indian Affairs: Laws and Treaties, 2:732. Washington, D.C.: Government Printing Office. http://dc.library.okstate.edu/digital/collection/kapplers/id/26573/rec/1. ———. , ed. 1904k. “Treaty with the Chippewa of the Mississippi and Lake Superior, 1847.” In Indian Affairs: Laws and Treaties, 2:542–45. Washington, D.C.: Government Printing Office. http://dc.library.okstate.edu/digital/collection/kapplers/id/26408. ———. , ed. 1904l. “Treaty with the Menominee, 1836.” In Indian Affairs: Laws and Treaties, 2:463–66. Washington, D.C.: Government Printing Office. http://dc.library.okstate.edu/digital/collection/kapplers/id/26304/rec/1. ———. , ed. 1904m. “Treaty with the Ottawa and Chippewa, 1820.” In Indian Affairs: Laws and Treaties, 2:188–89. Washington, D.C.: Government Printing Office. http://dc.library.okstate.edu/digital/collection/kapplers/id/26030/rec/1. ———. , ed. 1904n. “Treaty with the Ottawa and Chippewa, 1855.” In Indian Affairs: Laws and Treaties, 2:725–31. Washington, D.C.: Government Printing Office. http://dc.library.okstate.edu/digital/collection/kapplers/id/26566/rec/1. ———. , ed. 1904o. “Treaty with the Ottawa, Etc., 1807.” In Indian Affairs: Laws and Treaties, 2:92–95. Washington, D.C.: Government Printing Office. http://dc.library.okstate.edu/digital/collection/kapplers/id/25943/rec/1. ———. , ed. 1904p. “Treaty with the Ottawa, Etc., 1821.” In Indian Affairs: Laws and Treaties, 2:198–201. Washington, D.C.: Government Printing Office. http://dc.library.okstate.edu/digital/collection/kapplers/id/26040. ———. , ed. 1904q. “Treaty with the Ottawa, Etc., 1836.” In Indian Affairs: Laws and Treaties, 2:450–56. Washington, D.C.: Government Printing Office. ———. , ed. 1904r. “Treaty with the Potowatomi, 1818.” In Indian Affairs: Laws and Treaties, 2:168–69. Washington, D.C.: Government Printing Office. http://dc.library.okstate.edu/digital/collection/kapplers/id/26010. ———. , ed. 1904s. “Treaty with the Potowatomi, 1828.” In Indian Affairs: Laws and Treaties, 2:294–97. Washington, D.C.: Government Printing Office. http://dc.library.okstate.edu/digital/collection/kapplers/id/26135. ———. , ed. 1904t. “Treaty with the Potowatomi, 1832.” In Indian Affairs: Laws and Treaties, 2:353–56. Washington, D.C.: Government Printing Office. http://dc.library.okstate.edu/digital/collection/kapplers/id/26194/rec/1. ———. , ed. 1904u. “Treaty with the Sioux, Etc., 1825.” In Indian Affairs: Laws and Treaties, 2:250–55. Washington, D.C.: Government Printing Office. http://dc.library.okstate.edu/digital/collection/kapplers/id/26091. ———. , ed. 1904v. “Treaty with the Wyandot, Etc., 1795.” In Indian Affairs: Laws and Treaties, 2:39–45. Washington, D.C.: Government Printing Office. http://dc.library.okstate.edu/digital/collection/kapplers/id/25890/rec/1. ———. , ed. 1904w. “Treaty with the Wyandot, Etc., 1805.” In Indian Affairs: Laws and Treaties, 2:77–78. Washington, D.C.: Government Printing Office. http://dc.library.okstate.edu/digital/collection/kapplers/id/25928/rec/1. ———. , ed. 1904x. “Treaty with the Wyandot, Etc., 1814.” In Indian Affairs: Laws and Treaties, 2:105-07. Washington, D.C.: Government Printing Office. http://dc.library.okstate.edu/digital/collection/kapplers/id/25956/rec/1. ———. , ed. 1904y. “Treaty with the Wyandot, Etc., 1817.” In Indian Affairs: Laws and Treaties, 2:145–55. Washington, D.C.: Government Printing Office. http://dc.library.okstate.edu/digital/collection/kapplers/id/25987/rec/1. Lock, Gary. 2010. “Representations of Space and Place in the Humanities.” In The Spatial Humanities: GIS and the Future of Humanities Scholarship, edited by David J. Bodenhamer, John Corrigan, and Trevor M. Harris. Bloomington and Indianapolis: Indiana University Press. Loew, Patty. 2013. Indian Nations of Wisconsin: Histories of Endurance and Renewal. 2nd ed. Madison: Wisconsin Historical Society Press. McDonnell, Michael A. 2015. Masters of Empire: Great Lakes Indians and the Making of America. New York: Hill and Wang. Miller, Cary. 2010. Ogimaag: Anishinaabeg Leadership, 1760-1845. Lincoln and London: University of Nebraska Press. Miller, David W. 2011. The Forced Removal of American Indians from the Northeast: A History of Territorial Cessions and Relocations, 1620-1854. Jefferson, NC: McFarland and Company. Ramirez-Shkwegnaabi, Benjamin. 2003. “The Dynamics of American Indian Diplomacy in the Great Lakes Region.” American Indian Culture and Research Journal 27 (4): 53–77. Saler, Bethel. 2015. The Settlers’ Empire: Colonialism and State Formation in America’s Old Northwest. Philadelphia: University of Pennsylvania Press. Satz, Ronald N. 1991. “Chippewa Treaty Rights: The Reserved Rights of Wisconsin’s Chippewa Indians in Historical Perspective.” Transactions of the Wisconsin Academy of Sciences, Arts and Letters 79 (1). http://digicoll.library.wisc.edu/cgi-bin/WI/WI-idx?id=WI.WT199101. Tanner, Helen Hornbeck. 1987. Atlas of Great Lakes Indian History. Norman: University of Oklahoma Press. Warren, William W. 2009. History of the Ojibway People. Edited by Theresa M. Schenck. St. Paul: Minnesota Historical Society Press. Witgen, Michael. 2013. An Infinity of Nations: How the Native New World Shaped Early North America. Philadelphia: University of Pennsylvania Press.